4 YRS Shenzhen HDV Photoelectron Technology Ltd.
With distinct IC IC solution, low-temperature-rise chip, no need of cooling system, realization of flow control,decrease of broadcast storm. Supporting full-duplex flow control or half-duplex back pressure working pattern, along with Auto-negotiation. Providing indicator lamps for link-loss, electrical and optical link diagnosing, dynamic data transmission and full/halfduplex, data rate. 1 YRS Shenzhen Bestwe Electronics Technology Co., Ltd.
Giga fiber to rj45 converter sfp media converter : The HDV high stability Gigabit SFP Media Converter,fiber optic network switches convert 10/100/1000M ethernet to SFP fiber. 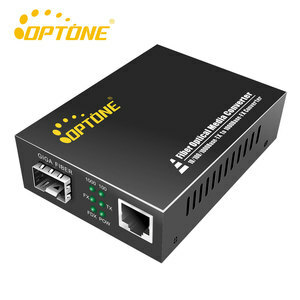 Customer can choose different 1000M SFP modules according to requirement, such as single mode or multimode,long transmission distance(1000Base-LX) or short transmission distance(1000Base-SX) or copper SFP module(1000Base-T) . The 10/100/1000 SFP Media Converters allows flexible network configurations using SFP transceivers supplied by BAUDCOM, Cisco or other manufacturers of MSA compliant SFPs. 3 YRS Shenzhen Yuhang Communication Technology Co., Ltd.
3 YRS Shenzhen Optone Technology Co., Ltd.
Lead time With more than 200 employees in my company,at least 10,000 connectors can be produced. Research Department With our separate research team,it is advantageous that we are albe to have products customized. 3). So if there are problems with the goods,replacement will be available. 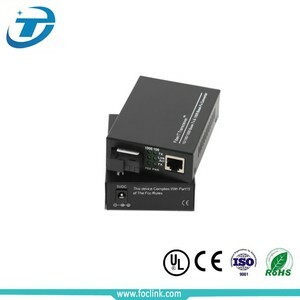 Giga SFP Media Converter for 10/100/1000M Gigabit Network, with LC Connector SFP This 10/100/1000M Gigabit Ethernet converter is used in backbone network transmission and is primarily used for Gigabit Ethernet devices links. 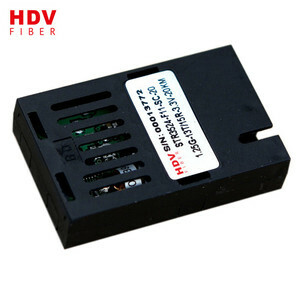 According to customers&rsquo;requirements, t his media convert e r supports single-mode and multi-mode fibers with a transmission distance of up to 12 0 km for single-mode fiber and 550 m for multi-mode fiber. The media converter takes advantage of intelligent connection technology to provide auto-negotiation thereby eliminating the need to manually configure or monitor settings. 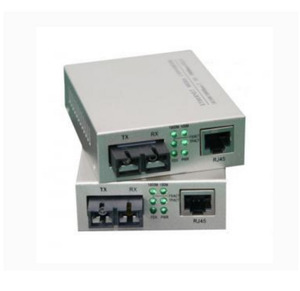 Designed under IEEE802.3ab 1000Base-T and IEEE802.3z 1000Base-SX/LX/LH standards, It is designed for use with multi-mode/single-mode fiber cable utilizing the LC-Type connector. It works at 850nm on both transmitting and receiving data when adopting multi-mode fiber and 1310nm on both transmitting and receiving data when adopting single-mode. They will transmit at extended fiber optic distances utilizing multi-mode fiber up to 0.55 kilometers and 10 kilometers when utilizing single-mode fiber . 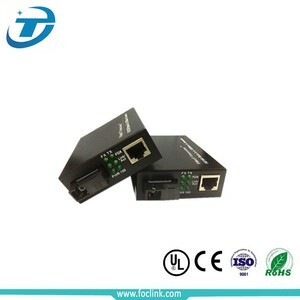 11 YRS Shenzhen Optfocus Technology Co., Ltd.
7 YRS Shenzhen BTON Technology Co., Ltd.
2 YRS Shenzhen HDV Photoelectron Technology Ltd.
3 YRS Wuhan Maiwe Communication Co., Ltd.
8 YRS Shenzhen Hilink Technology Co., Ltd.
10G Fiber Optic Media Converter Features &diams;10G base Fiber Optic Media Converter &diams;1 -Port 10G Base RJ45 port + 1 ports 10G base SFP slot &diams;10G Mbps auto-negotiation for copper port &diams; Auto MDI/MDI-X for copper port. 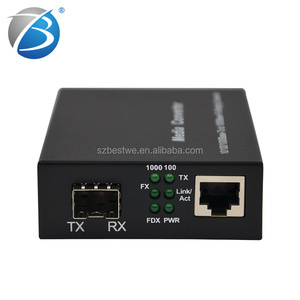 &diams;Complies with IEEE 802.3u, IEEE 802.3X, IEEE 802.3,IEEE802.3z 10Gbase-sx/lx &diams;Extend network distance up to 120 km &diams; Can be b uild in 2U 14 slot media converter chassis Specification Specification Product Name 10G Media Converter Product Model YH-MC-10G Interface RJ-45: 10G Base-TX Fiber:10G Base-FX (SFP ) Network Protocols IEEE802.3 10BASE-T; IEEE802.3i 10Base-T;IEEE802.3u;100Base-TX/FX; IEEE802.3ab ; IEEE802.3z 10G base-Tx ; IEEE802.3x; Fiber Media Multi-mode: 2km; Single-mode: 20-120 KM Forwarding Mode Store-and-Forward Flow Control Full-duplexIEEE802.3x Flow Control Half-duplex backpressure flow control Power Supply DC5-20 V Consumption &lt; 5w Working Environment Environment temperature:-10&#8451; ~ +60&#8451; Storage temperature: -40&#8451; ~ +75 &#8451; Humidity: 5%-95% (No-condensing) Weight & Size Product Weight: 0.1KG/pc Product size (L&times;W&times;H): 12cm &times; 8.5c m &times; 2.1c m Warranty 3-years Product Display Package Workshop Show Exhibition Show Payment & Shipping contact me anytime freely ! 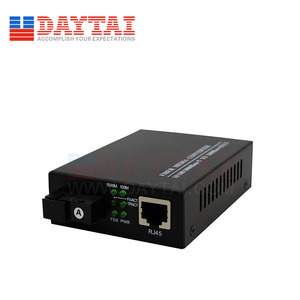 Product Details 1000M Fiber Optic Media Converter to rj45 ethernet port and one 1.25Gbps fiber port via copper cables The BLY-1G1E is a 10/100/1000Mbps adaptive gigabit Ethernet Fiber Switch. 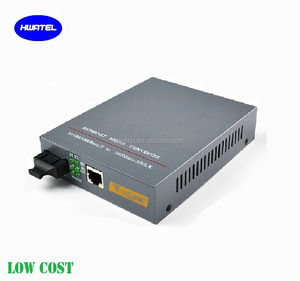 It has one 10/100/1000Mbps Ethernet port and one 1.25Gbps fiber port. It extends the transmission distance from 100m to 120km via copper cables. Alibaba.com offers 99 giga media converter products. About 89% of these are fiber optic equipment. 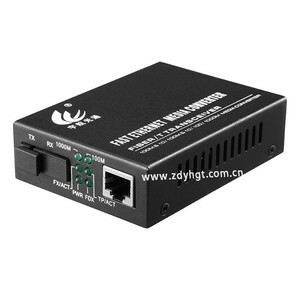 A wide variety of giga media converter options are available to you, such as 10/100mbps, 10/100/1000mbps. You can also choose from free samples. There are 99 giga media converter suppliers, mainly located in Asia. The top supplying country is China (Mainland), which supply 100% of giga media converter respectively. 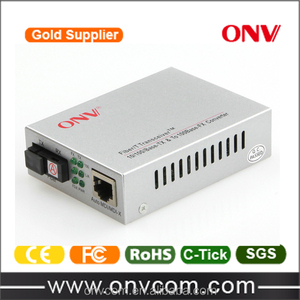 Giga media converter products are most popular in Domestic Market, Southeast Asia, and South Asia. You can ensure product safety by selecting from certified suppliers, including 35 with Other, 24 with ISO9001 certification.